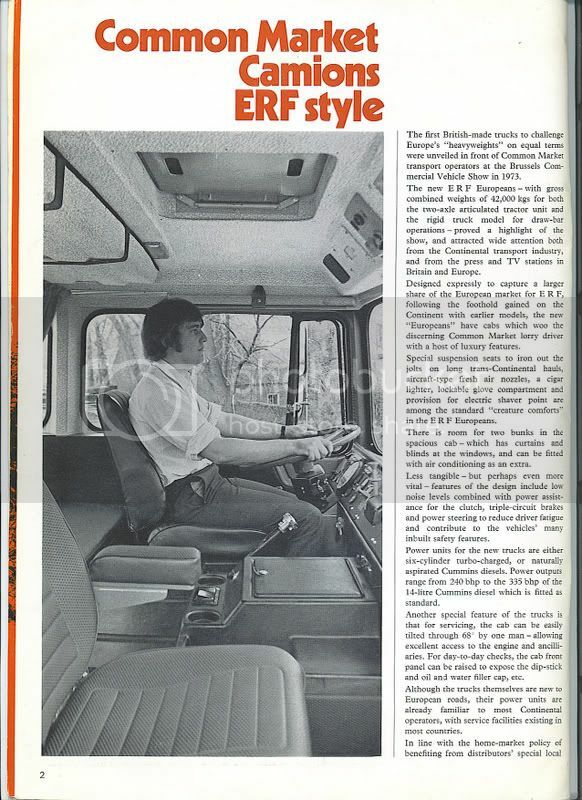 Recently found article in Truck magazine early 90's, the ERF 'European' or to give its correct model designation NGC 420. 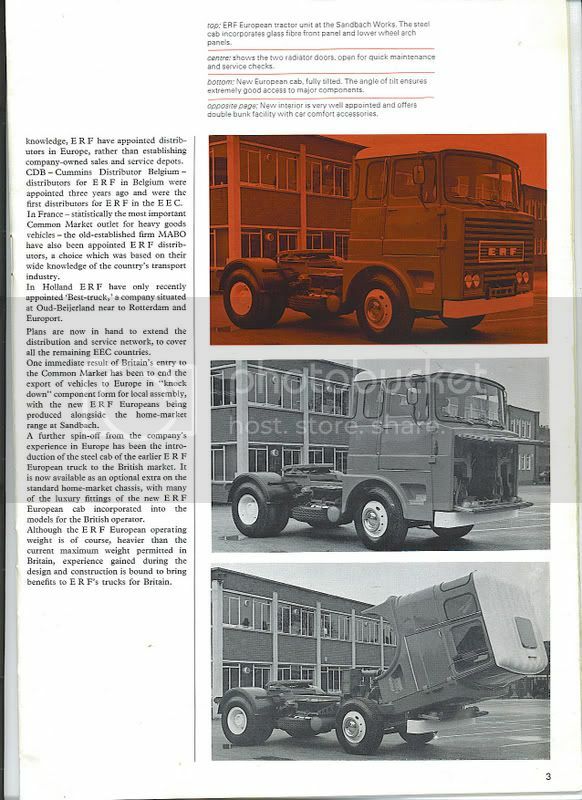 380streamline wrote: Recently found article in Truck magazine early 90's, the ERF 'European' or to give its correct model designation NGC 420. The 140 should have been faster on a straight climb, though. 350bhp (gross) beats 335. If I remember correctly, the 140 had 920lbft, the NTC335 890 or thereabouts. The 140 would also make a nicer racket, although this is a matter of taste. Also a taste issue- the LB Scania was a better-looking machine. 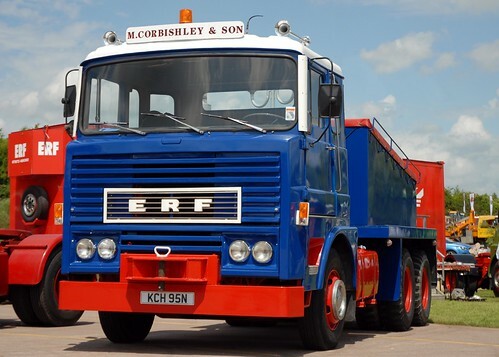 The ERF European (and the Dennis of the period) were blatant, shameless and inferior rip-offs of Scania's styling- the Swedes should have kicked both firms through the courts. [zb] anorak wrote: The 140 should have been faster on a straight climb, though. 350bhp (gross) beats 335. If I remember correctly, the 140 had 920lbft, the NTC335 890 or thereabouts. The 140 would also make a nicer racket, although this is a matter of taste. Also a taste issue- the LB Scania was a better-looking machine. 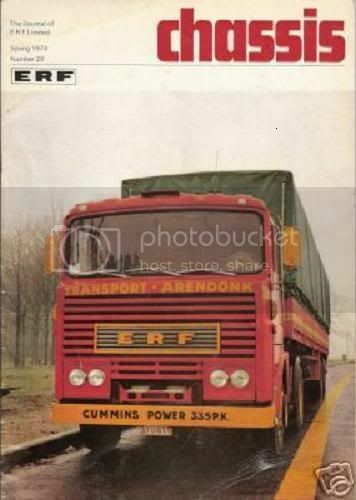 The ERF European (and the Dennis of the period) were blatant, shameless and inferior rip-offs of Scania's styling- the Swedes should have kicked both firms through the courts. I have heard one or two people refer to these motors as "Sandbach Scanias" in the past, must be because the front grille and bonnet is similar to a 111 / 141. Anyone else ever heard that said about them?? Last edited by 3300John on Thu Feb 26, 2015 2:06 pm, edited 3 times in total. Think this is the one Albert Dale had from new. Last edited by 3300John on Thu Feb 26, 2015 2:07 pm, edited 1 time in total. 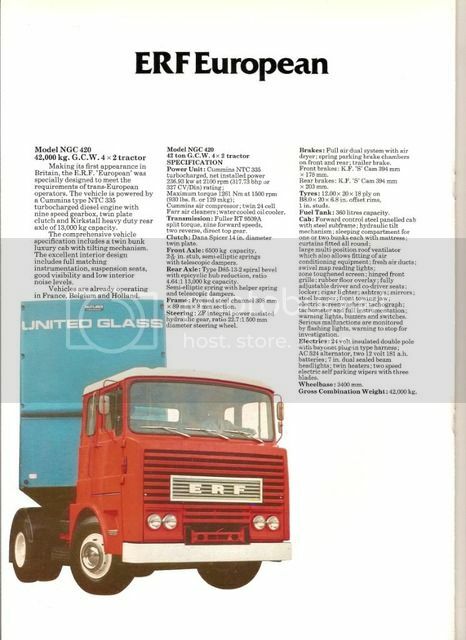 Hi John,glad you liked the picture and it's great to hear from someone who knew the lorry from new.Spoke to my dad (who drove GEH for John Simmons)and as far as he can remember John bought GEH from Beechs garage at stoke after Albert Dale sold it. Did you also drive a 7mw?. I've seen a picture of one in Beresfords colour's JDF 132N and didn't know if it was a subbie or not. So i'm pretty sure it was never a recovery truck, although i have seen pictures of a red 7mw recovery truck. If thats the one you mean it wasn't GEH. Shame they had to raid the parts bin for mirror arms-door hinges-door handles- etc etc & no doubt etc from the C series. Not to mention designing the thing for the 180 Gardner before realizing that the Cummings was a tad longer, no sweat they just put a longer front section on below the screen and hopped that no one would notice. Dodgy Permit wrote: Shame they had to raid the parts bin for mirror arms-door hinges-door handles- etc etc & no doubt etc from the C series. A,B,C whats the odds (have you looked carefully at the posted pictures) and my post was tounge in cheek. Does anyone know if this one belonged to Beresford's or did a subbie own it? And if this one and Albert Dale's were the only 7mw's in Beresfords colour's. Does anyone have any interior pictures? Last edited by 3300John on Thu Feb 26, 2015 2:08 pm, edited 1 time in total. toomanybikes wrote: Does anyone have any interior pictures? Last edited by Me.Paul.101 on Mon Mar 25, 2013 11:57 am, edited 1 time in total. Has anyone ever seen a right hand drive one of these???? It was built as LHD and converted to RHD. Did they have many of these? most firms who had them had at least 2 or 3. Obviously didn't run abroad with it did they? Tadge of photoshop going on there imo? If this is the same wagon I'm thinking of, it came from Belgium and was sat in a plant hire place in Burscough for a while.